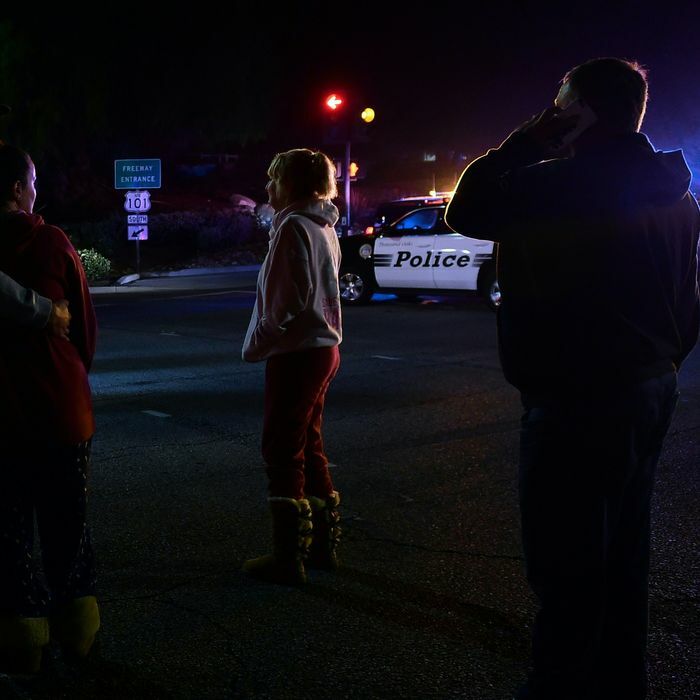 A gunman entered a bar and dance hall in Thousand Oaks, California, late on Wednesday night and fired multiple shots, killing at least 11 patrons and a sheriff’s deputy. Police said the gunman was also dead when officers arrived at the scene. Captain Garo Kuredjian, a spokesperson for the Ventura County Sheriff’s Office, said the shooting at the Borderline Bar and Grill started at about 11:20 p.m. The venue, which describes itself as the county’s largest country dance hall and live music venue, was hosting a “College Country Night.” About 100 people were inside at the time. “People started running to the back door,” she said. Someone yelled “Get out — he’s coming,” and she fled as the gunman fired another round of shots. A man and his stepfather interviewed by ABC7 Eyewitness News said they heard about a dozen shots before they were able to flee out the front door. He said the gunman, who was wearing a hat and a black jacket, then threw a smoke grenade. Eyewitnesses said people used chairs to break the windows and escape. Chandler Gunn, 23, told the San Diego Tribune that when he heard about the shooting he rushed to the bar and called a friend who works at Borderline, who like many of the bar’s regular patrons was also at the Route 91 Harvest music festival in Las Vegas when a gunman killed 58 people and wounded hundreds.